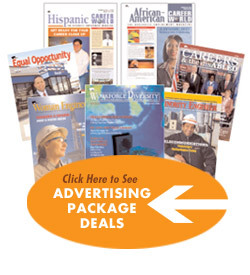 Audience: Hispanic Career World, published since 2001, is a career-guidance/recruitment magazine distributed by direct request to student, MBA, entry-level, and professionals in the all career disciplines who are Hispanic- sent to their home address. In addition to direct subscribers, distributed by direct request in bulk to all 1,400 four-year universities, 34 top graduate schools, and all 296 accredited engineering schools at their placement offices. Also distributed to all related student & professional associations.